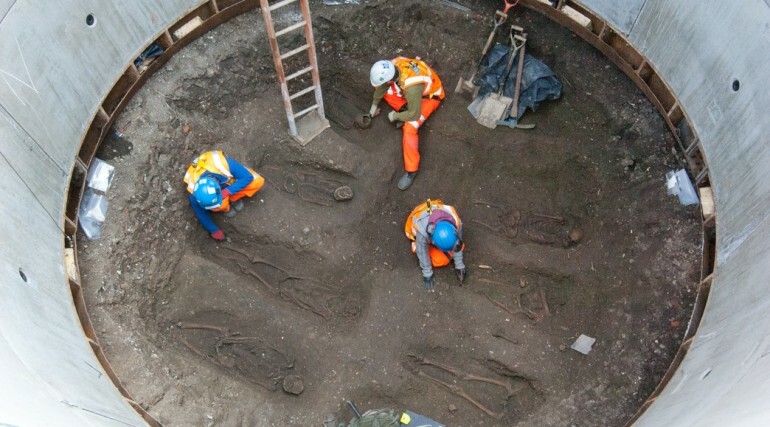 14th Century burial ground discovered in London - Crossrail . For information about the Elizabeth line please visit the Transport for London website. 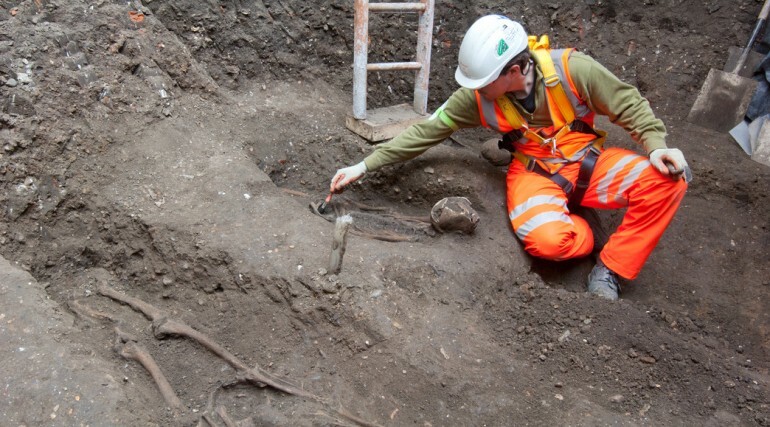 Twenty three skeletons have been uncovered lying in two carefully laid out rows on the edge of Charterhouse Square at Farringdon, and are believed to be up to 660 years old. 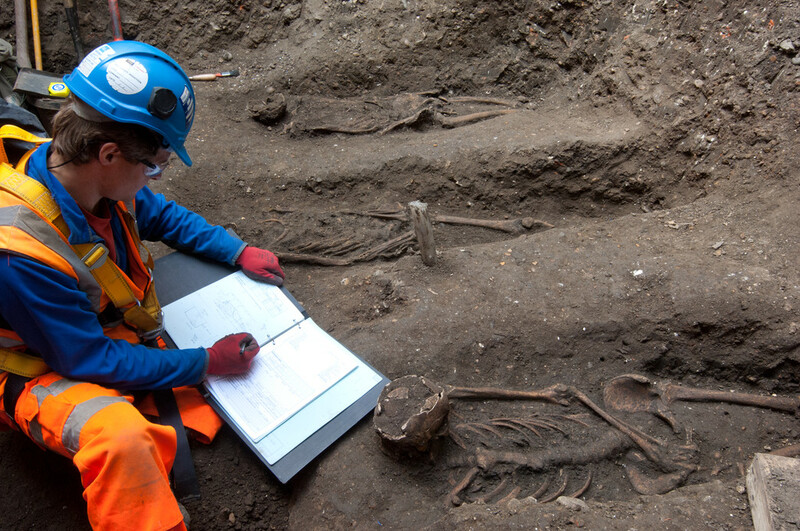 Historical records reference a burial ground in the Farringdon area that opened during the Black Death Plague in 1348. The limited written records suggest up to 50,000 people may have been buried in less than three years in the hastily established cemetery, with the burial ground used up until the 1500s. Despite significant development in the Farringdon area over the centuries, the burial ground, described in historical records as “no man’s land”, has never been located. 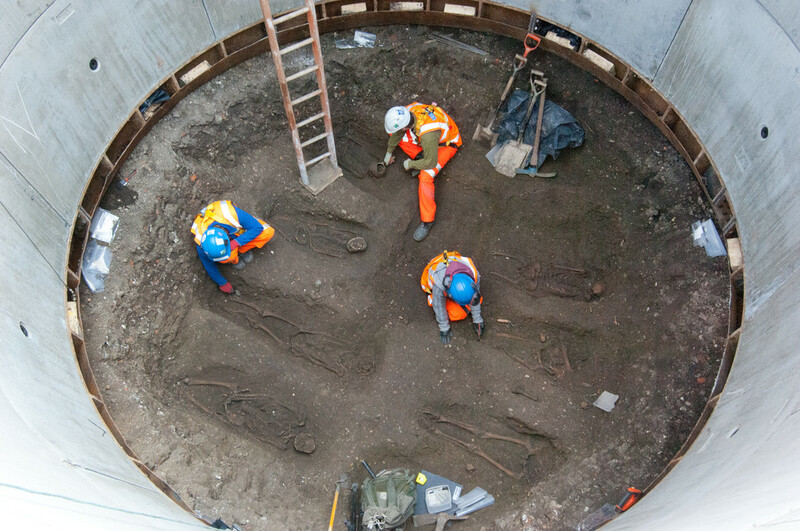 During the past two weeks, Crossrail’s archaeologists uncovered 23 skeletons 2.5 metres below the road that surrounds the gardens in Charterhouse Square. 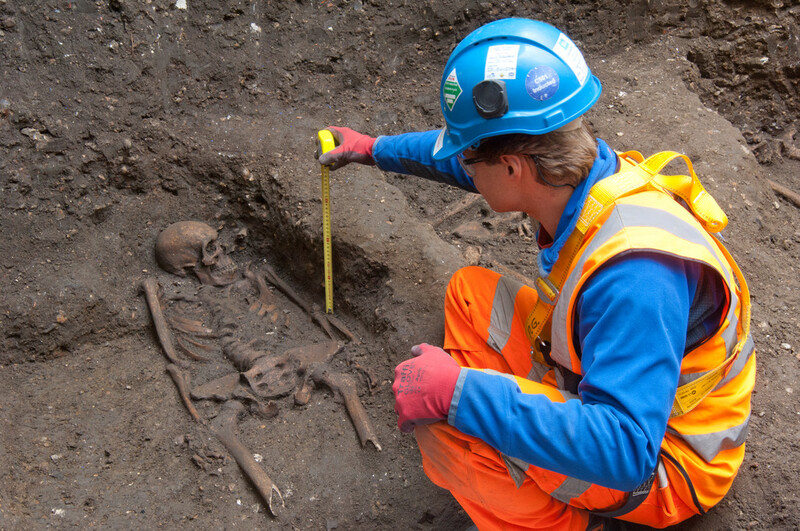 The depth of the burials, the pottery dated up until 1350 found in the graves and the layout of the skeletons all point to the likelihood that these skeletons were buried in Charterhouse Square during the Black Death Plague around 1349. The graves have been laid out in a similar formation as skeletons discovered in a Black Plague burial site in east Smithfield in the 1980s. 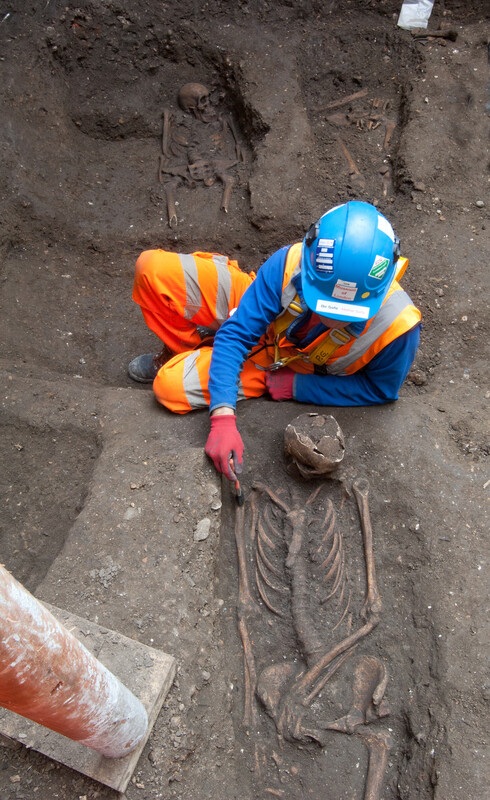 The skeletons are being carefully excavated and taken to the Museum of London Archaeology for laboratory testing. 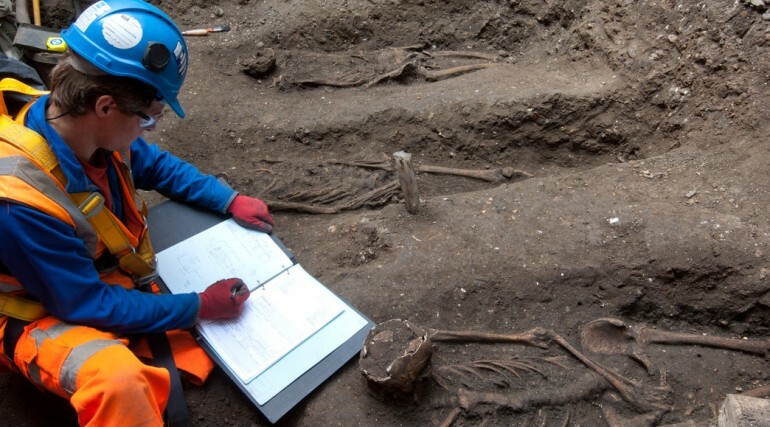 The scientists are hoping to map the DNA signature of the Plague bacteria and possibly contribute to the discussion regarding what caused the Black Death. The bones may also be radio carbon dated to try and establish the burial dates. Plague cannot survive for very long in the soil. After 650 years, only the skeleton bones remain and do not present any modern-day health risk. Charterhouse Square had previously been identified as a possible site for the lost burial ground as it was one of the few locations in Farringdon to remain undeveloped for the past 700 years. 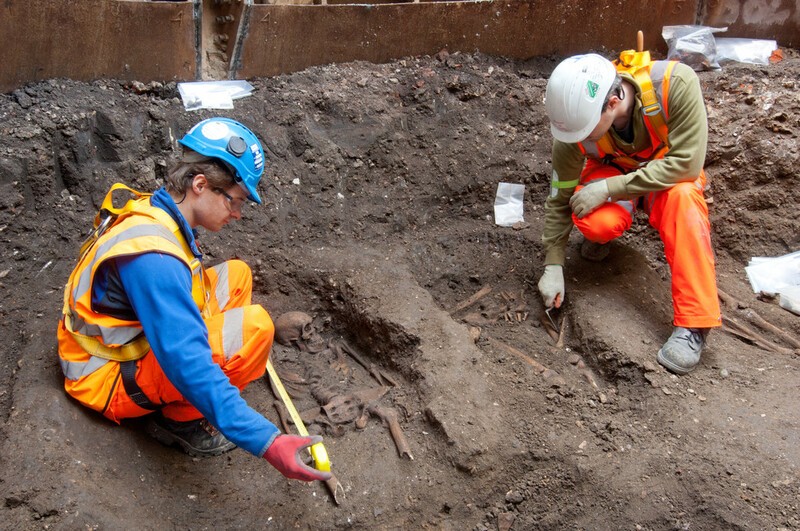 In 1998, a single skeleton was discovered buried at Charterhouse Square when archaeologists were investigating the location of a chapel shown on historic maps. On its own, this was not enough evidence to confirm a burial ground. 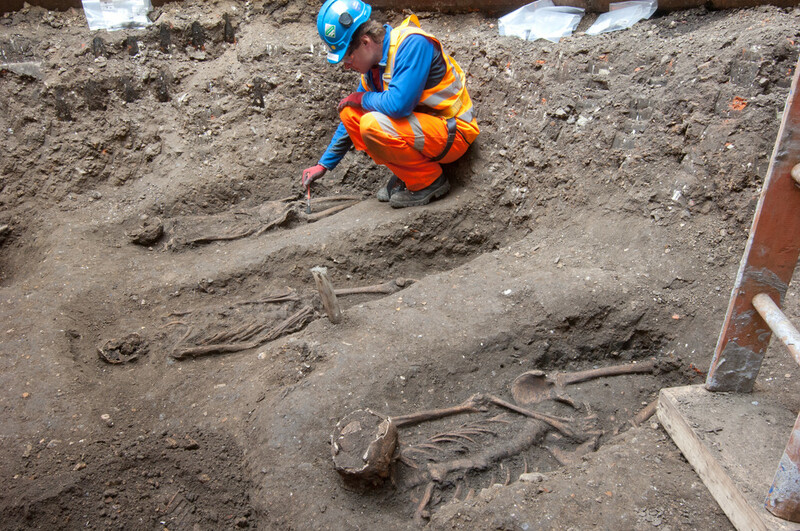 Two years ago during associated utility works in Charterhouse Street, Crossrail archaeologists located human bones that had previously been disturbed and suggested a burial ground could be nearby. 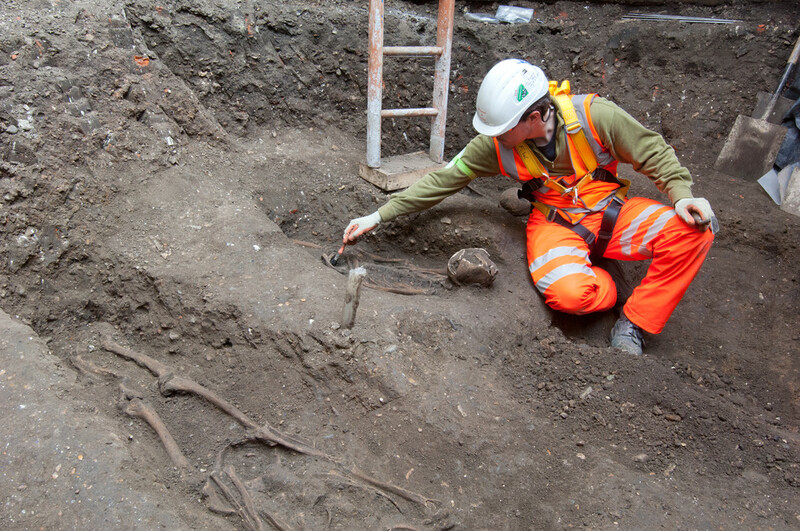 These are not the first skeletons found on the Crossrail project, with archaeologists already uncovering more than 300 burials at the New Cemetery near the site of the Bedlam Hospital at Liverpool Street from the 1500s to 1700s. Outside of office hours and at weekends, an out-of-hours communications officer can be reached via the 24-hour Crossrail Helpline on 0345 602 3813. 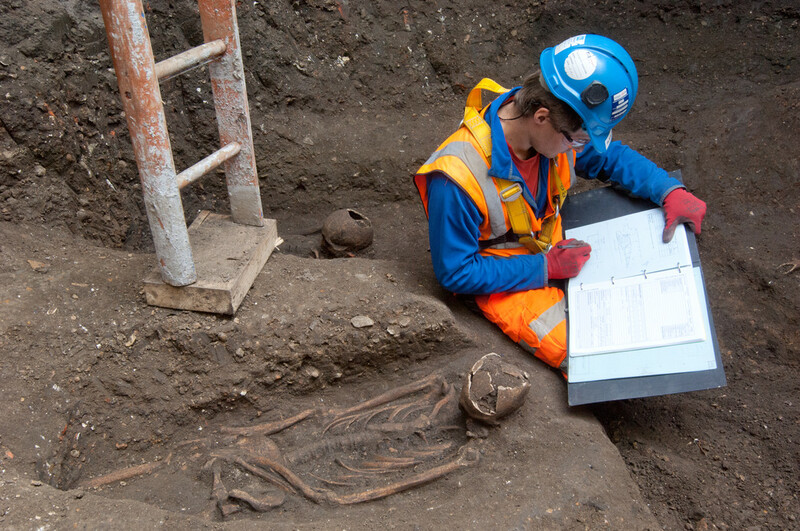 Archaeologists have undertaken investigations in a 5.5 metre diameter shaft being excavated in the road around Charterhouse Square gardens, near to the former Carthusian Monastery. The skeletons have been found 2.5 metres below the road. Archaeologists also hope to find Roman artefacts as they dig deeper. Once the archaeologists have finished their work, Crossrail excavators will dig the shaft down to 20 metres with the site to be used to support tunnelling works. Once laboratory analysis of the bones has been completed, the skeletons will be treated in accordance with our license from the Ministry of Justice. In the 1980s a burial ground associated with 1348 Black Death was located in east Smithfield. 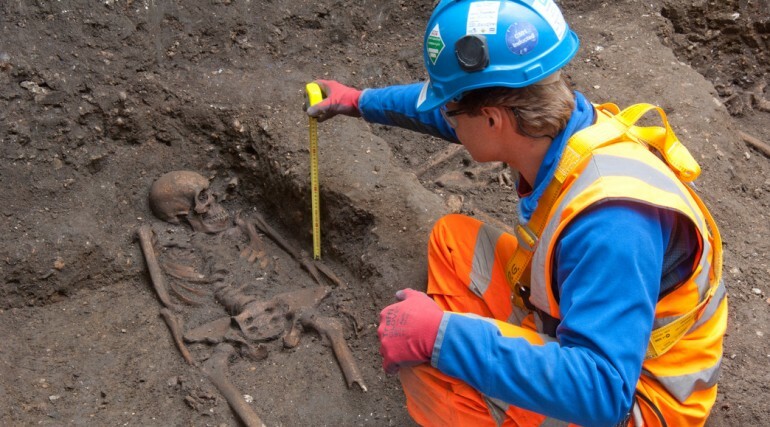 More than 600 skeletons were carefully removed from the site and analysed by the Museum of London Archaeology. London Charterhouse was a Carthusian Monastery founded in 1371 outside the walled city of London. Written records suggest the site was chosen due to its proximity close to one of three emergency burial grounds set out in 1348. Previously that summer, a plague had swept with speed across all of Europe, killing an estimated 30 to 60 per cent of the European population. In total, about 75 million people are believed to have died in the four year global pandemic including 25 million Europeans. 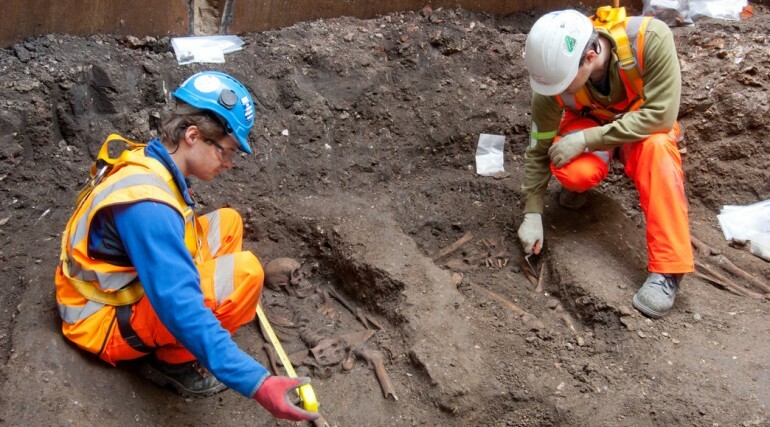 The 16th Century historian John Stow stated that more 150,000 victims of the Black Death were buried in London. 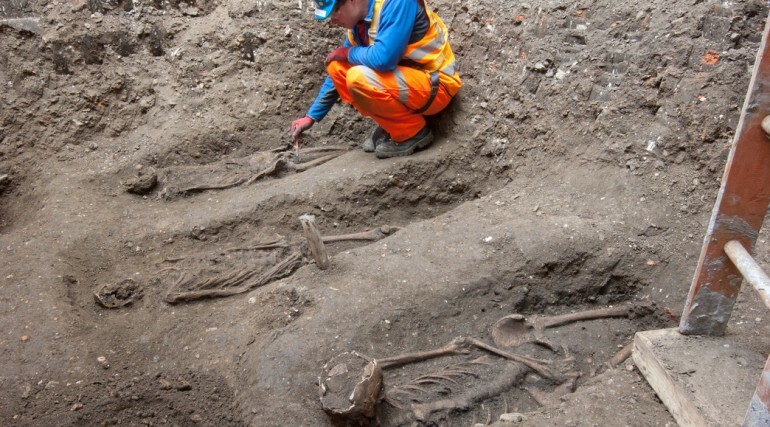 According to Stow, there was a burial ground in Farringdon known as ‘No Man’s Land’ which was established in 1348, and was subsequently used to bury more than 50,000 victims of the Black Death. It is thought that the burial ground at Charterhouse continued in use as the monastery developed through to the mid-16th Century and became the outer cemetery with its own chapel. 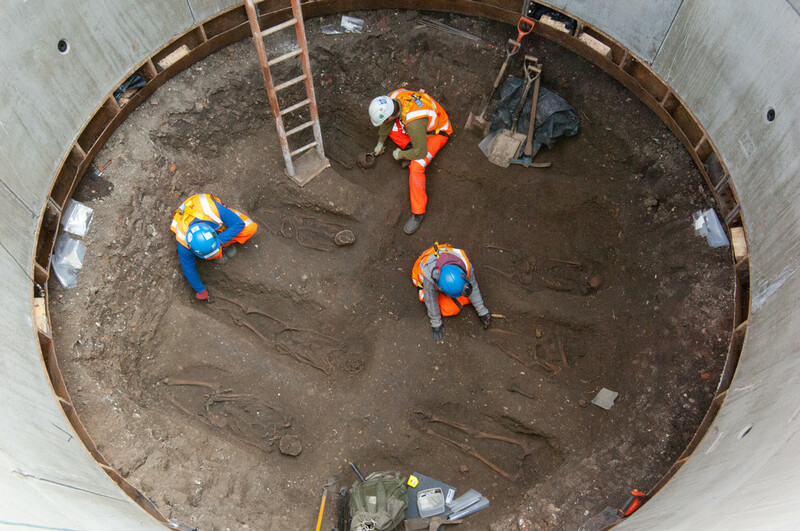 The Farringdon site is the latest find made as part of the UK’s largest archaeology programme taking place across more than 40 Crossrail worksites. Among the other artefacts that have been found are, the UK’s largest piece of amber ever discovered, bones from huge prehistoric animals that roamed the iced-covered London plains and items used by humans during the Bronze Age, Roman and Medieval times. 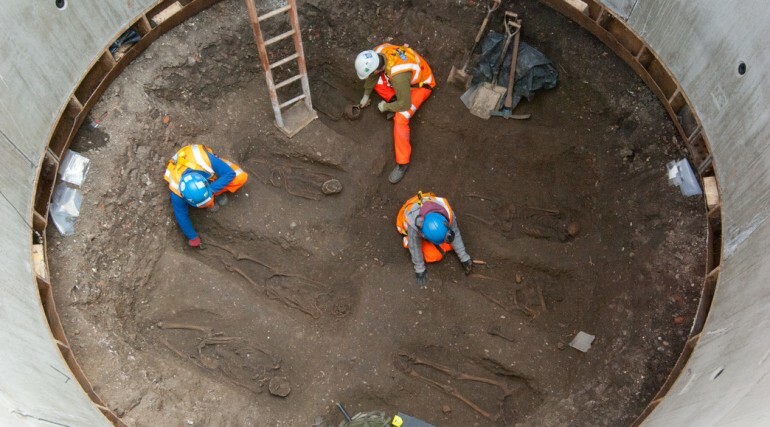 Crossrail is also delivering the UK’s largest archaeology programme.